Trigger student engagement and energize learning through real-life problem solving. Engage your students with learning aids in computer science, science, technology, engineering and math. Boost learning curves and help all your students reach their curriculum targets. With the help of LEGO® MINDSTORMS® Education EV3, the only challenge you’ll have is getting your students to leave the classroom! 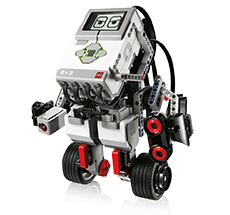 Discover how EV3 resources can meet your needs with hardware, software and activity packs. Discover participatory content that complies with national regulations. Extend learning and comprehension with EV3 curricular packages of special theme. Achieves instant success with science, technology, engineering and mathematics. FAQs, downloads and compatibility tips.